[0:00] <DaQatz> If mplayer has a driver for it. [0:00] <dmsuse> there is already a driver for the framebuffer? [0:00] <DaQatz> I do not yet have my pi. So Not played with that yet. [0:12] <Aldasa> any quake III servers? [0:14] <Aldasa> anyone hosting a quake III deathmatch? [0:16] <Aldasa> lol, u guys are funny tonite! [0:49] <Aldasa> has anybody got pi running on a sandisk micro 16gb class 6? [1:18] <SpeedEvil> The internet is amazing. [1:18] <SpeedEvil> I can lie under the blankets, and order 10 cabbages for delivery on monday. [1:19] <winocm> sorry about that. [1:20] <SpeedEvil> Tescos search blows. [3:03] <mkopack> ok, OMG, "The Avengers" was AWESOME! [3:09] <janua> Is anyone using a Sony SDHC 8GB card with their Pi? I tried to boot from it this evening but it wouldn't boot. [3:19] <janua> mkopack: How do i find out? [3:20] <mkopack> um, is there anything on the card that has like a C with a little 10 or 4 or 6 on it? [3:20] <mkopack> Did you write the os image onto it correctly? [3:21] <mkopack> ie: you didn't just copy the image file, but actually did the dd ? [3:22] <janua> Anyway, i used DD when i got the card, copied onto the card, and then tried to use parted to fix the partitions since i will be using the debian image. But this didnt go to well after, so i decided to try again. But i didnt think i needed to format it to use dd on it again. So that is what i did, ran dd again and then tried to boot it on the pi as a 2gb partition, and it wouldn't boot. Do you think this may have effected it? [3:24] <janua> When i plug my device into linux, it comes up as two devices /dev/mmcblk0 and /dev/mmcblk0p1, which should i use dd to copy to? [3:25] <janua> So what is p1 then in this case? [3:26] <janua> Do these cards come partitioned? [3:26] <tzarc> well did it ask you to format it when you stuck it in? [3:26] <janua> So i wrote the img to a partition? [3:27] <janua> tzarc: And dd probably didnt complain when it couldnt write after the end of a potentially small partition? [3:29] <janua> So that is the reason it wasnt being mounted when i reinerted it? [3:29] <tzarc> yeah, it can't detect the filesystem type, because it's no longer a filesystem! [3:36] <janua> tzarc: Mounts! Excited! Do you know how to enable sshd for the boot sequence? [3:37] <tzarc> i think there's some file on the first partition that enables it? [3:39] <janua> I wont question it too much and get booting! [3:43] <bjorn`> Drunk conversations for free! [5:38] <wcchandler> which image is "liam's image" with xbmc and omxplayer? [5:38] <wcchandler> is that the current debian image? [6:57] <kallisti5> question. Which uart on the arm is pointed to the uart breakout pins? [7:08] <ShiftPlusOne> you're asking us mere mortals? [7:08] <ShiftPlusOne> though shouldn't that be something you'd get from the schematic? [7:09] <Crenn-NAS> And usart0.... what?! [7:20] <kallisti5> even though the pi really isn't a BCM2835.. i guess thats what vidcore emulates? [7:20] <ShiftPlusOne> I just like that we can get an access level that low on such a board. [7:21] <ShiftPlusOne> probably a conflict of interest of some kind where he can't really give too much info out. [7:21] <ShiftPlusOne> what do you mean the pi isn't a BCM2835 though? [7:24] <ShiftPlusOne> I thought that's exactly what the pi had. [7:50] <ShiftPlusOne> kallisti5, after you get uart working you'll be able to hook up a 3.3v ttl-usb cable and be able to debug what's actually going on a bit better? [8:28] <ShiftPlusOne> I think I might jump on that as well when I get mine... just to tinker with some assembly maybe. [8:35] <kallisti5> well.. everything points to the ports being "standard-like"
[11:47] <janua> What do i need to run to boot up LXDE on the debian image? Im about to run out the door and trying to show someone before i go but cant find it in the wiki! [11:56] <gordon_drogon> and possible chapesses..
[12:03] <Simon-> tzarc: what file are you using with imagetool-uncompressed.py ? [12:06] * gordon_drogon gives raspbian a go again. [12:07] <tzarc> where are you compiling it? [12:08] <tom_______> with "sudo make"
[12:09] <tzarc> tom: have you got the kernel sources to compile against? [12:09] <tom_______> hmm I don't know. [12:10] <tom_______> What package should I get ? [12:10] <RITRedbeard> I keep reading those youtube things "...and I'm a Mormon." as "...and I'm a Moron." [12:11] <Simon-> is the driver in the mainline kernel? [12:13] <benzeman> hey, problem with the RS order code... my mate has just put his code in, then the session timed out, and now the code is invalid! if I get him to give RS a ring, will they be able to simply reactivate it? [12:17] <gordon_drogon> ok. will have a look. just looking to add in ipv6 and my usual firewalling stuff - looks like the iptables helpers are missing. [12:17] <gordon_drogon> I might put one directly on the net for some friends to remotely access. [12:18] <gordon_drogon> I temd to build custom kernels for all my servers anyway - old habits and all that! [12:18] <gartenzwerg> you can check your USB ID with "lsusb"
[12:20] <tom_______> lsusb gives me Bus 001 Device 004 : ID 2001.... D-Link Corp.
[12:21] <gordon_drogon> bother. thought I was in-luck with libSDL, but looks like it's not quite in raspbian yet. [12:22] <tom_______> lsusb gives me Bus 001 Device 004 : ID 2001:3c15 D-Link Corp.
[12:40] <Simon-> tzarc: I've got it booting against 3.3! [12:57] <ShiftPlusOne> Simon-, sorry, was at work. Yeah, I am aware that you can run assembly within linux, that's just no fun. [12:58] <ShiftPlusOne> mozzwald, what keyboard were you using? [13:01] <bjorn`> After my latest -Syu my framebuffer config seems to be gone with the wind. How do I enforce a fbdev resolution? I'm assuming bootargs but how is this done, I can't seem to find anywhere to put them? [13:03] <mervaka> whats the logic? [13:04] <mervaka> truth tables and karnaugh maps are your friend! [13:06] <mervaka> need to see whether i can run a webcam without requiring an X server etc first.. hope so! [13:09] <ollymorfik_> whats the camera for? 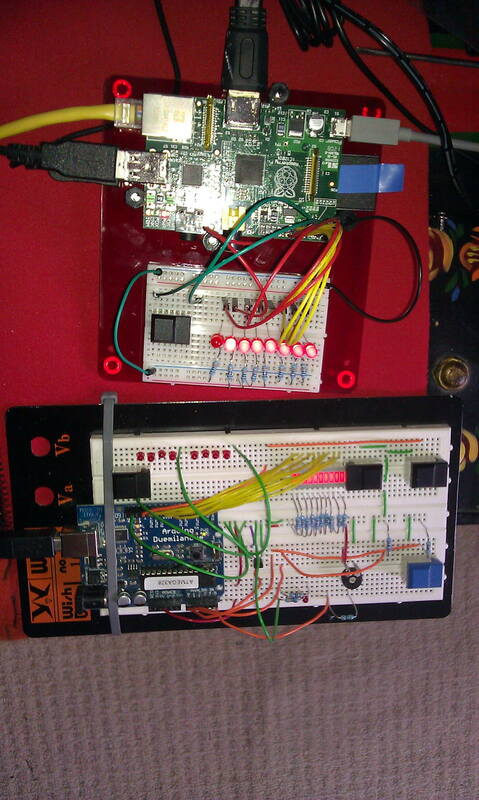 [13:11] <gordon_drogon> Gert published all his GPIO code for the Gertboard. [13:12] <gordon_drogon> that's a C library. [13:12] <gordon_drogon> makes it look sort of arduino style. [13:13] <gordon_drogon> there's a couple of SPI kernel drivers out there, I think. Not had the time to do one myself, but if the others work OK I might not bother. [13:13] <mervaka> i gather i'd probably have to write a kernel module or something? [13:15] <gordon_drogon> but maybe someone else will do it as I'm short of time for the next couple of weeks. [13:18] <mervaka> might have to have a go hacking the currentcost meter..
[13:20] <SpeedEvil> mervaka: Why do you have multiple channels? [13:24] <gordon_drogon> we have a dumb meter..
[13:57] * TopherBrink gives the secret Raspberian Salute. [14:08] <gordon_drogon> working on improving the efficiency of text entry/screen updates for my BASIC. [14:09] <Cheery> what are you doing then to improve it? 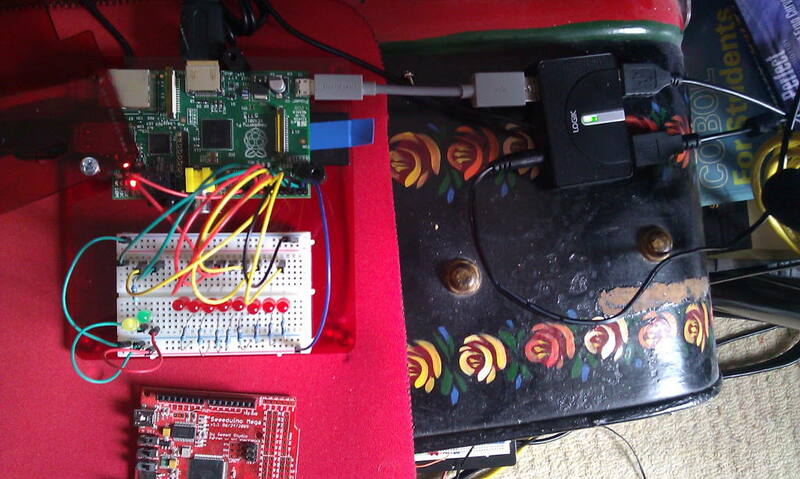 [14:09] <gordon_drogon> since there's no hardware blit on the Pi, it's done by the Arm and slow. [14:10] <gordon_drogon> So SDL has the ability to just update small rectangles - so I need to update just the character rectangles. [14:10] <Cheery> what makes you think that is the problem to solve? [14:11] <gordon_drogon> one issue is that if I let a key autorepeat then the Pi can't keep up with it. [14:11] <tntexplosivesltd> surely there's no advantage to using SDL if there's no hardware acceleration? [14:11] <gordon_drogon> heh... it's somewhat challenging to go graphics in curses. [14:12] <gordon_drogon> although early versions did use curses and had a separate graphics window. [14:12] <Cheery> hey gordon_drogon, since you have a pi, could you git clone git://github.com/cheery/pygame_tutorial.git ? [14:12] <tntexplosivesltd> HoldenC: where'd that nick come from? [14:14] <Cheery> gordon_drogon: thing is my apps are highly likely updating screen as much as your stuff.. and that gives us a hint whether it's something to work on. [14:15] <gordon_drogon> Cheery, for the most part it's just fine. it's only character entry that's slow - we're updating a tiny bit of the screen, but calling updaterect on the whole surface. [14:15] <Cheery> also.. shouldn't SDL be able to run in terminal as well? [14:15] <gordon_drogon> it runs on the console. [14:15] <gordon_drogon> however I can repeatedly crash the Pi requiring a power cycle that way. [14:16] <gordon_drogon> there is some issue with requesting a size not avalable and it then crashing the pi. [14:16] <gordon_drogon> I think the overscan settings get in the way. [14:17] <gordon_drogon> it's almost done installing git... so slow..
[14:18] <gordon_drogon> ok - got it - need to change screen inputs & run up X - back in a moment. [14:21] <gordon_drogon> Cheery, does it do anything else other than the yellow bars? [14:23] <Cheery> try paint/main.py as well plz. [14:25] <Cheery> yes, it isn't supposed to fill the whole window anyway. [14:25] <gordon_drogon> it can't keep up with the mouse when moved fast..
[14:25] <gordon_drogon> that's what happens with tuxpaint too. [14:27] <Cheery> does a lot to the looks. [14:34] <gordon_drogon> Hm. maybe it's going too fast on my workstation - let me copy it to the pi..
[14:38] <gordon_drogon> all I want to do is poke pixels at a screen. [14:39] <Cheery> could handle OpenGL ES and bit more even.. but I don't have the rpi yet. [14:40] <Cheery> I'll include optimization tut into pygame. 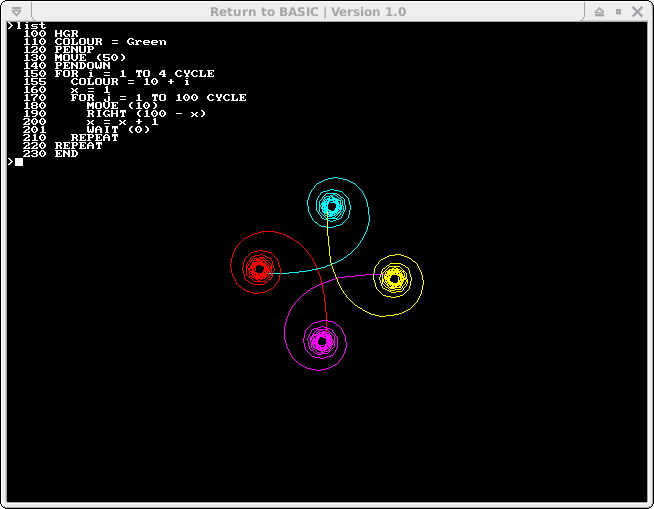 ;) and possibly gles tutorial as well. [14:40] <Cheery> you know RPi limits are just useful for teaching optimization..
[14:44] <gordon_drogon> what's the resolution of time() in Python? [14:45] <Pixman> Can anyone recommend a good site for RasPi homebrew software? [14:46] <Cheery> Pixman: there are some that advertise themselves.. but are you just wanting a distribution channel? [14:47] <gordon_drogon> oh, a float. hmmm. [14:52] <gordon_drogon> TIME in my BASIC increments every 1000th. [14:52] <gordon_drogon> if you say so. [14:53] <Cheery> ReggieUK: lol don't be negative. I dislike basic too but find his stuff interesting. [14:54] <gordon_drogon> it wouldn't be proper BASIC without them though. [14:54] <Cheery> gordon_drogon: do you have grammar compactly explained somewhere? [14:54] <ShiftPlusOne> kind of confused by "raspberry pi homebrew" isn't homebrew only applicable to completly closed platforms? What't the difference between normal raspberry pi software and homebrew raspberry pi software? [14:55] <Cheery> ShiftPlusOne: nothing. But in other hand 'homebrew' is just an insult word anyway. [14:55] <gordon_drogon> is a very crude attempt at a manual - work in progress. [14:55] <gordon_drogon> homebrew - as in beer? [14:55] <Cheery> ShiftPlusOne: homebrew in closed platform isn't less worthy than the closed software itself. [14:56] <Cheery> actually the opposite. [14:57] <Pixman> ShiftPlusOne, it's already available by git? [14:58] <gordon_drogon> not many people will be able to get & compile stuff (if needed) from there though. steep learning curve for those coming in from (e.g.) windows type environment. [14:59] <gordon_drogon> I'm looking to make .deb's of my stuff and provide a .tgz at the same time. [14:59] <Cheery> Pixman: would pi.boxbase.org go, if I'd change the boxbase.org frontpage? [14:59] <gordon_drogon> I have my own hosting, so that side isn't an issue. [15:00] <Cheery> Pixman: hmm... if you describe what it should have.. I could try. [15:00] <gordon_drogon> I must spend some more time with git of hg to work out what's best for me. [15:01] <gordon_drogon> I liek the hgweb front-end thing on boxbase.org though. [15:01] <Cheery> Pixman: no,, I mean the site itself. [15:02] <gordon_drogon> wonder if I have any old domains lying about that are nice..
[15:02] <Cheery> Pixman: do you like the blog in codeflow.org ? [15:03] <ShiftPlusOne> tzarc, thanks, didn't know that existed. [15:04] <Pixman> what do you think? [15:04] <Pixman> that components the site should have? [15:05] <gordon_drogon> makes a change to see something in C rather than PHP..
[15:09] <gordon_drogon> brb. got to sort out the roast..
[15:10] <Cheery> Pixman: though you think I could do this later in the winter if somebody doesn't get to do it first? [15:14] <gordon_drogon> bother. oven not quite hot enough yet. [15:14] <gordon_drogon> theres lots of people doing their own thing - but what exactly do you mean by homebrew? [15:14] <gordon_drogon> software, hardware, etc. ? [15:17] <gordon_drogon> that's sort of what I'm doing, but it's mostly so I can keep track of my own stuff now! [15:20] <gordon_drogon> actually, I do like that theme I'm using. Also works OK on mobiles too. [15:20] <gordon_drogon> domains and hosting are relatively cheap these days. [15:25] <Pixman> mh... like raspi? [15:30] <Pixman> and I think people should be smart enough to click on "model B version" or "model C version"
[15:30] <tntexplosivesltd> why is everyone expecting this thing to be one? [15:31] <Pixman> btw, are the ALSA drivers already there? [15:31] <Pixman> experimental ones I mean? [15:32] <Pixman> mh, they are included with the debian image on raspi.org? [15:35] <tntexplosivesltd> you're using debian? [15:36] <tntexplosivesltd> new to linux? [15:37] <tntexplosivesltd> any reason you chose debian over arch for the pi? [15:39] <tntexplosivesltd> releases of what? [15:43] <IT_Sean> What's the service cost? [15:51] <Pixman> maybe GPU accelerated it would work? [16:06] <ShiftPlusOne> Pixman, which chipset? [16:11] <Pixman> can you upload it to mediafire? [16:13] <Pixman> am I assuming right, that GIT, when cloning, copies everything to RAM first and then writes it on the hard drive? [16:19] <ShiftPlusOne> Pixman, that's how I did it, yeah. [16:19] <ShiftPlusOne> are you using '2011_0719_RT3070_RT3370_RT5370_RT5372_Linux_STA_V2.5.0.3_DPO' ? [16:28] <ShiftPlusOne> well 'fine'.... mine broke, lol. [16:37] <Cheery> I might be able to do something for that.. but I don't like about the idea that it wouldn't be portable. [16:38] <Cheery> also there's that wayland thing. [16:38] <Cheery> GLES and some input code is all you'd theoretically need for a superb UI. [16:39] <Cheery> and it's the way how you'd do it anyway! [16:40] <Cheery> hamitron: I'd change more than that. [16:41] <Cheery> there's an order since I can't split up and do everything at once. [16:42] <Cheery> I can roll out some instructions that help a lot if you are interested about taking a try. [16:42] <Cheery> that needs time too though. [17:13] <ShiftPlusOne> mozzwald, my keyboard is a logitech one as well. Is yours backlit and/or with an LCD screen? [17:25] <Hexxeh> anyone know if there's a high-street store that'll sell a serial interface for the rpi? [17:27] <Cheery> hamitron: is that a surprise to you? [17:29] <Cheery> do you people understand color theory a bit? [17:30] <Cheery> well the thing I consider is about complementary colors. [17:31] <Cheery> doing subtractive mixing might still work okay. [17:31] <Cheery> now the reflective mixing attempts to simulate pigments that are mixed together! [17:33] <Cheery> in theory, pigments might give all kinds of results. [17:40] <sajimon> hello everyone, hows rpi availability throughout distributors these days? [17:43] <sajimon> any delivery estimations if i would order it now? [17:44] * gordon_drogon catches up. [17:44] <gordon_drogon> Accellerated X. neat. [17:51] <mozzwald> what type of connector did he use? [18:00] <gordon_drogon> I got some nice patch leads from skpang to hookup the GPIO port on my Pi. [18:01] <gordon_drogon> good if going to a breadboard. [18:02] <gordon_drogon> not really a fan of ebay for little stuff like that. [18:03] <Gadget-Mac> Or buy the bits ? [18:03] <gordon_drogon> yes. they're all 150mm - it might be nicer for shorter ones. I have a big pack of varying lengths for my other boardboarding stuff. [18:04] <gordon_drogon> I think those are the same ones that skpang are selling - the sparkfun ones! [18:08] <gordon_drogon> it's easier if I just buy some when I'm buying other stuff from skpang - I really can't be bothered shopping around, buying some here, some there, etc. [18:09] <gordon_drogon> I won't use paypal and most ebay sellers won't take bank transfer. [18:10] <gordon_drogon> any reason why not? [18:12] <Hexxeh> kexec is awesome. [18:14] <chris_99> interesting, so it's swapping the kernel Hexxeh ? [18:14] <ReggieUK> uboot based or from the ground up? [18:15] <ukscone> Hexxeh: kexec and judicious use of pivot_root/switchroot? [18:32] <chris_99> the RPi has some kind of BIOS on the SoC right? [18:37] <hotwings> its not impossible at all. i dont know what all is patched in the kernel to get rpi to work but it could be systems that dont see much change. or if they do, the changes wouldnt break the patches. [18:41] <kallisti5> Simon-: could I just call the kernel's entry function from within that asm? [18:41] <kallisti5> (well.. other then "entry"
[18:47] <UukGoblin> hi guys, where could I find docs about the GPIO pins and the extra connectors? [18:48] <Simon-> UukGoblin: on the wiki. [18:56] <mdavey> UukGoblin: The connectors are reserved for future use for a LCD display and camera. [18:57] <D34TH> so they are modified usb ports? [19:07] <kallisti5> Simon-: ok. working great. the kernel entry at 0x8000 was essential. [19:08] <Simon-> kallisti5: you tried putting it earlier? [19:13] <Hexxeh> who was it who was telling me about initrd's worked the other day? [19:15] <kallisti5> Simon-: Ah. What's t he purpose of putting kern_addr @ 0x20? [19:16] <kallisti5> Simon-: do you think that jumping from _start -> kern @ 0x8000 would work without the pc, kern_addr? [19:19] <kallisti5> Simon-: verified working. [19:27] <kallisti5> Simon-: ah. something the bootloader slips in? [19:28] <SpeedEvil> umm - what? [20:00] <benzeman> does Ash Stone ever come on IRC? [20:24] <SpeedEvil> Or something that rhymes anyway. [20:29] <carldani> I fear I have talked too enthusiastically about the Pi... my wife started learning Python a few days ago. [20:29] <aditsu> do you fear she'll make you redundant? [20:30] <carldani> I specialize in low-level driver programming... not really something you'd do with Python. [20:30] <carldani> aditsu: That said, python is a gateway drug. [20:31] <carldani> I'm not that good at python myself, so there is a real chance she'll be better than I am. [20:31] <carldani> The fun think with firmware and driver programming is that I sometimes have to fix my bugs with a soldering iron. [20:33] <carldani> aditsu: I can relate to that. [20:35] <IT_Sean> wow... how spastci are you? [20:41] <aditsu> carldani: so do you think you can help write some drivers to make better use of the pi's capabilities? [20:45] <carldani> aditsu: I have written Linux kernel drivers in the past, and AFAIK a Linux kernel SPI driver for the Pi does not exist. I know SPI very well, so that's on my TODO. [20:50] <IT_Sean> He doesn't want his? [20:52] <IT_Sean> Ah, so there are strings attached. [20:54] <aditsu> what can you offer? [20:59] <ukscone> aditsu: it's "i4m1337"
[21:01] <IT_Sean> I'll give you my IRC password, which will get you Ops in 5 channels on this network, in exchange for one of those. [21:02] <amelia_> Pfft. Blinded by pixels, you are. [21:09] <carldani> Hydrazine: I announced in the forms a few weeks ago that I'd try to write a Linux kernel SPI driver... maybe you saw that. [21:11] <carldani> my final goal is to abuse the Pi as a flash programmer, and add full flashrom support for its GPIOs. [21:13] <carldani> Adobe flash is PUS. (Possibly Unwanted Software). [21:25] <carldani> ReggieUK: I'm the maintainer of flashrom, I worked on the FT2232H flashing driver in flashrom. [21:26] <carldani> I think that's supported just fine. [21:28] <bootc> evening - any RPi kernel experts about? [21:43] <Toneloc> so, is the rpi in the hands of the masses yet ?? [21:46] <Toneloc> SpeedEvil- did you get yours yet? [21:50] <DaQatz> Still listed as backordered. [21:55] <Simon-> it adds constaints on "this software"
[21:56] <mdavey> Simon-: where is that from? [21:56] <Dagger2> well, it says "Notwithstanding the above"
[21:57] <SpeedEvil> The paragraph is in effect null anyway - it just clarifies the licence for stupid people. [21:58] <mdavey> who owns the copyright on that? [21:59] <UukGoblin> what sort of embedded memory does the raspi have? [21:59] <UukGoblin> i.e. what tells the processor to boot from SD? [21:59] <UukGoblin> is it ROM or some sort of EPROM? [21:59] <SpeedEvil> Simon-: In principle - yes - but if it's just stating that there is no broadcom software that is under free licences other than the GPL - it's not a restraint. [22:00] <SpeedEvil> You can't assume that. [22:00] * gordon_drogon catches up. [22:00] <UukGoblin> Nr90, GPU? like, graphics processor? [22:00] <mdavey> Simon-: you could argue that the file in question is not covered under a GPL license, but something that is based on GPL. But it is pretty clear that it is Broadcom that owns the copyright, so it is up to them how they wish to license the code. [22:01] <SpeedEvil> A modified GPL licence that has clauses struck from it by the nature of GPL does not mean it's a valid licence. [22:01] <Gadget-Mac> What do you need ? [22:02] <mdavey> Right. And unless you try linking that to something that belongs to Broadcom and is not licensed under GPL, that clause doesn't apply. [22:03] <SpeedEvil> The GPL prohibiting adding restrictions doesn't mean that by removing it you have a valid licence. [22:03] <SpeedEvil> Simon-: If the licence is valid. [22:03] <mdavey> It also prohibits linking to most non-GPL licenses. [22:03] <Dagger2> mdavey: but if you do try linking it to something that belongs to Broadcom and is not licensed under GPL, that clause still doesn't apply... because the GPL prohibits that clause and that clause starts with "Notwithstanding the above"
[22:04] <bootc> Gadget-Mac: does 'echo foo > /dev/ttyS0' crash your RPi? [22:04] <SpeedEvil> Simon-: As a more explicit example - if someone puts a completely incompatible licenced thingy in with the kernel, and ships it as source to someone - that doesn't mean that the person has any sort of licence to that bit of code. It simply means they have no licence. [22:07] <Simon-> even if it's not told to use ttyS0? [22:08] <bootc> you know, like "Decompressing kernel..."
[22:13] <mdavey> It is not clear to me whether the "notwithstanding" statement applies to jus the preceding paragraph (the special exception), or both paragraphs. [22:19] <Simon-> isn't that what it already does? [22:22] <Simon-> is the provided kernel compressed? [22:27] <bootc> describes the PL011 UART. For details of the mini UART see 2.2 Mini UART." [22:28] <bootc> that will be seen as a start bit and the UART will start receiving 0x00-characters." [22:31] <bootc> write the registers!" [22:33] <Simon-> are the alternative GPIO configurations per pin or global? [22:36] <Simon-> Rebasing (4/10685) this is going to take a long time. [22:40] <mukti> Where is everyone getting their power supplies from? [22:41] <mukti> haltdef: What one did they suggest? Did they provide a link somewhere? [22:42] <haltdef> during ordering they said "you might find these useful"
[22:43] <mukti> I was looking at a 1A one from monoprice, I'll probably just pick it up when I order my HDMI cable,USB hub, etc. [22:43] <mukti> Is anyone using wireless on their RaspPi? [23:01] <gordon_drogon> I'm using a powered hub to power the Pi. [23:01] <gordon_drogon> Hub has a 2A PSU. [23:07] <Hexxeh> has anyone had an initrd run on the raspi? [23:08] <Hexxeh> is it just a case of appending it to the kernel image? [23:09] <gordon_drogon> but not me. [23:21] <DaQatz> If I do an ext2 image that seems to work. [23:21] <DaQatz> Yet to try on it on a pi since they have not shipped me mine. [23:22] <Hexxeh> DaQatz: how's it done exactly? [23:23] <Hexxeh> is it just appended to kernel.img? [23:24] <DaQatz> You can specify the initramfs from inside the kernel when you build it. Or use the boot loader. [23:26] <DaQatz> Okies in "General setup" -> "Initramfs source files"
[23:27] <DaQatz> There you can set the image location. [23:28] <DaQatz> I do not recommend using the "dir" but rather the actual image. [23:28] <DaQatz> The dir one has never worked rigth for me. [23:40] <Hexxeh> DaQatz: i've enabled that, but i don't see any location option? [23:41] <DaQatz> No "() Initramfs source file(s)"
[23:41] <Hexxeh> and it cooks it in when building the image? [23:42] <DaQatz> It will try to make a cpio, or use a given a file if it has a .cpio extension. [23:45] <DaQatz> If it's a dir, it will try to make a cpio out of it. If it's a file with no .cpio extension it expects it to be a "space separated" list of files to make a cpio with. If the file has a.cpio it just uses it. [23:46] <DaQatz> At least as far as I can tell from using the feature. [23:53] <fragalot> Any chance of rpi's being released in the future with 2 network ports? [23:56] <DrumGeek> fragalot: Me too! [23:57] <DaQatz> Hmm I tend to use ldd to figure that out. [23:57] <DaQatz> Sure nothing was missed? [23:57] <DaQatz> Or is there a reason to not use busybox? [23:59] <DDave> still only "register your interest"